"Raid," pronounced like "ride," is a Finnish TV series (and a later movie) about a scruffy hit man whose nickname relates to the bug spray ("kills indoors an outdoors" is one version). The series is very entertaining, wryly funny, and follows the strain of crime fiction that flows from Western, cowboy fiction. 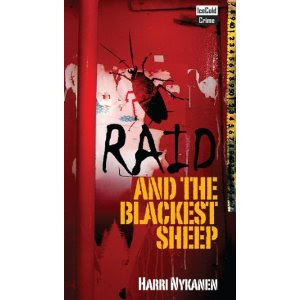 Raid and the Blackest Sheep is the first of the Harri Nykanen novels (on which the series was based) to be translated into English by the new Ice Cold Crime imprint. The book is essentially a road novel rather than a mystery, though there are some revelations at the end. Raid is helping a career criminal named Nygren who has returned home to Finland for a kind of farewell tour, settling scores and making amends. A hard-nosed detective is trying to find out if Nygren is planning a last heist, and Raid's friend on the police force, Lieutentant Jansson, is lured out of a rehabilitation center (where he's supposedly losing weight) when Raid calls him. The result is a wild ride across Finland, with colorful characters among the police and the criminals very much in evidence. Raid himself is a curious combination of laid-back friendliness and ruthlessness, with a dash of very dry wit. Nykanen's writing is quite unlike anything else in Scandinavian crime fiction (even the other Finns), with perhaps more in common with neo-noir writers like Alan Guthrie. The book also has something in common with the dour and off-center comedy of the leading light of Finnish cinema, Aki Kaurismäki. Ice Cold Crime also publishes the Helsinki Homicide series, by Jarkko Sipila, the second volume of which is in my short stack tbr pile. The television series is also Finnish, not Swedish. Juri: Thanks for letting me know about my typo, I've corrected it in the post above. I well remember listening to the Finnish language in the TV series, and even had a chance to hear the director of the movie version and the actor who played Raid when they introduced the film here in Washington DC. But my fingers were obviously moving faster than my brain when I typed "Swedish" instead of "Finnish" in the original post.